When you insert a CD or DVD in a drive Windows detects this and two technologies will be ready to handle the disc: AutoRun and AutoPlay. You have probably heard the two names before, but do you know the difference between them? In this article we will explain the difference between AutoRun and AutoPlay. If you insert a commercial CD or DVD in your drive, a menu interface from the software producer will often be shown automatically on your screen. Or, in some cases, an installation program will be automatically started. The technology that handles this is called AutoRun. When the disc is inserted in the drive Windows will examine the root directory of the disc and check if a special file with the name Autorun.inf exists there. If this file is found the contents of the file will be read. This special file contains a set of command that tells Windows how to handle the contents of the disc just after it has been inserted in the drive. Mostly it is used to automatically start a program, for example a menu shell program or a setup program, but it is also possible to make a document or a movie (etc.) on the disc to be opened / played automatically when the disc is inserted in the drive. If you insert a non-commercial CD/DVD in your drive, for example a disc that you have burnt yourself, then it is very likely that a dialog box with a list of options will be shown on the screen. The dialog box will look like the one in the picture to the right. The list of options (also called actions) in the dialog box is created immediately after that Windows has examined the file contents of the disc. Which options will appear in the list depend of what types of files are found on the CD/DVD. If the disc contains movies, an option to start Windows Media Player will be added to the list. If the disc contains pictures, a program to show a slide show of the pictures will be added. An option to start Windows Explorer is always included in the list. The technology that handles this is called AutoPlay. And the dialog box that is showed automatically is often referred to as the AutoPlay dialog box. The purpose of the AutoPlay functionality is to make it easier for the user to handle the contents of a disc. If the user chooses an option in the AutoPlay dialog box, a program that know how to handle the file type will be launched. AutoRun and AutoPlay can also be used with USB Flash drives (USB sticks) and other non-optical storage media types. When used with non-optical storage media AutoPlay functions in a similar way as with CDs or DVDs - the AutoPlay dialog box is shown with a list of options to handle the contents in the media. The AutoRun functionality behaves little different; an option to run the program or open the document (or play the movie etc.) is usually added to the option list in the AutoPlay dialog box. And to perform the action, the user has to click with the mouse or press a key on the keyboard. Runs a program, shows a document or plays a movie (etc.) automatically on a disc just after it has been inserted in the computer. 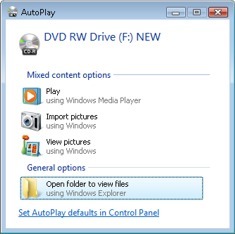 When used with non-optical media, an option to open the file is added to the AutoPlay dialog box. Shows a dialog box (called the AutoPlay dialog box) with a list of options that the user can choose between to handle the contents of the media. If you want to get more detailed information about the AutoRun technology you can read the The Autorun.inf file (in Windows), What is it? article on our Internet site. If you want to read more about AutoRun / AutoPlay and USB flash drives you can read this article on our Internet site: Using AutoRun with a USB Flash Drive (USB stick). Also Wikipedia has two good articles available that describes AutoRun and AutoPlay in detail.